By combining the Hide All windows shortcut with the minimize keyboard shortcut in Mac OS X, you can use a third ‘Minimize and Hide All’ shortcut that both hides and minimizes all windows open on a Mac. This hide and minimize all trick is accomplished by hitting the Command+Option+H+M keys together. The effect is instantaneous and immediately clears the display of any and all application windows, without closing or quitting any of the apps. As the title suggests, rather than closing anything, this keyboard shortcut will hide all other applications and windows, in addition to minimizing the currently active application or window into the Dock, effectively clearing the entire screen and giving you a blank view of the desktop on the Mac. If you have Dock icon translucency enabled as shown in the screenshot, the hidden apps will appear as translucent. 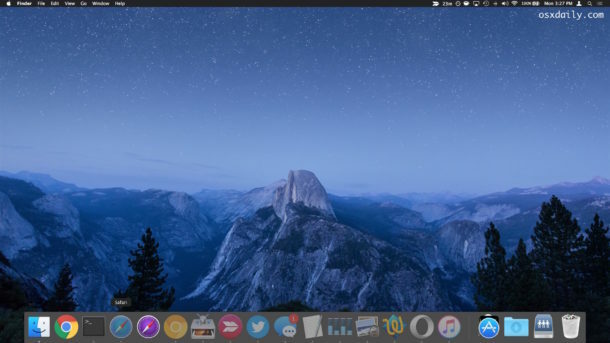 Meanwhile, the minimized windows from the foremost app will be in the Dock separately, on the right-hand side of the Dock as minimized windows appear as usual. This works the same in just about every version of OS X tested, from Lion to Mavericks to Yosemite. Heads up to @sambrowne for the great little keyboard shortcut tip. If you have any little-known yet awesome keystrokes like this for OS X, let us know! Maybe you’re new, or perhaps just stupid. I’ll clue you in on a little secret. We don’t give a rats @ss what Windows users can do, or for how long they’ve been able to do it. It’s this sort of response that earns many Mac users their often well deserved perception of arrogant [..people]. I use OS X and Windows. They’re both good, both have strengths and weaknesses. Give it a rest already, and say something productive. That’s for showing the desktop, not minimizing and hiding windows. We’ve always been able to show the desktop on OS X, just like Win+D. But can you still see open windows/applications in the task bar. This shortcut minimizes all windows and hides them from the dock, so that it appears as if no windows are even open. I’ve been trying to do this for ages! Thanks! It appears that this will not work unless you have single-app mode enabled (Dock icon translucency). Without it, the hotkey will hide all except the top window. Thanks for the great tip though, it’s very useful with translucency enabled. In 10.7.x (don’t know about previous versions of OS X), an EASY way to toggle back and forth between a blank desktop & your current open windows is by pressing ⌘F3. You’re welcome. Glad my tip was helpful to you! I know I can TAB through the windows, but I want them ALL back at the same time before doing the Command+Option+H+M command. Did you ever find out how to do this :)!?! And would love to know how to get back to my current project :D.
As well as to whomever can&will also say how to do so. Thank you for this very useful tip! Wasn’t the Command+Option+Click [on desktop] supposed to do the same? :( Doesn’t work on OSX El-Capitan. doesn’t work when you active application in fullscreen mode. Given the fact I use my applications only in fullscreen, your trick doesn’t work for me in fact.